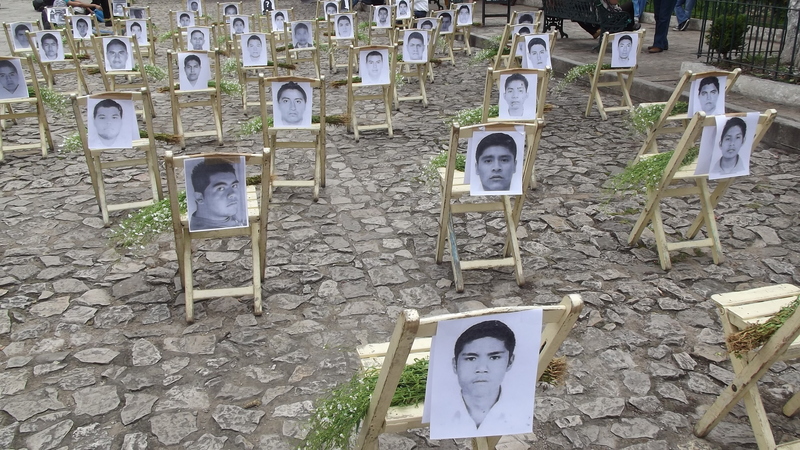 On September 3, almost four years after the disappearance of the 43 students of Ayotzinapa in Iguala, Guerrero, the First Report of the Special Follow-up Mechanism of the Inter-American Commission on Human Rights (IACHR) was presented at the Rural Normal School. The event was attended by Esmeralda Arosemena, rapporteur for Mexico of the IACHR; Luis Ernesto Vargas, commissioner of the IACHR; Paulo Abrāo, executive secretary of the IACHR; Jan Jarab, representative in Mexico of the UN High Commissioner for Human Rights, and Luis Raúl González Pérez, president of the National Commission of Human Rights (CNDH). In this document, the IACHR confirms its rejection of the “historical truth” that the Mexican government has been defending in the face of what happened. He emphasizes that of the nine telephone numbers belonging to the disappeared students that registered activity on the night of their disappearance, “at least one of them” was found in the possession of a public security official of Guerrero, a fact that has not been investigated and should be so promptly. Likewise, the report points out the possible participation of elements of the Federal Police for what it calls to analyze the activities that the elements of said corporation had in Iguala that day and to resolve the chain of command that ordered their mobilization. Regarding the participation of the military, the IACHR indicates that the contradictions presented by the statements of elements belonging to the 27th Battalion and the photographic material in their possession, which records the detention of the disappeared students, must be clarified. In addition, it requests that the alleged links of various elements of the 27th Battalion with organized crime through arms trafficking or even some relatives with leaders of the Guerreros Unidos Cartel should also be investigated. On 26 September, protests were held in several cities in Mexico as well as abroad to commemorate the forcible disappearance of the 43 students of the Isidro Burgos Rural Teachers College of Ayotzinapa, Guerrero, which took place on 26 September of last year, and to demand justice. The parents of the students marched in Mexico City after holding a 43-hour hunger strike, and subsequent to a meeting with the president in which they presented 8 demands that were dismissed. At the Zócalo of the capital, the parents of the disappeared thanked all those who supported them in their time of need. One of the parents, Epifanio Álvarez, expressed gratitude for the popular support, saying, “Here we are standing upright. If they will kill us, we will face them directly. Our sons are innocent. We will struggle for them and the thousands of other disappeared. Thanks to all who continue to struggle in the rain supporting us.” The claims were that the authorities have done nothing concrete to return the students, and that they do not accept the government’s equivocations with regard to the “historical truth” and the devalorization of the report published by the independent experts of the Inter-American Commission on Human Rights (IACHR). The parents of the disappeared have called for a General Popular Assembly for 16 October, to be held at the Ayotzinapa Rural Teachers College, where they will define the plan of action for the coming months. At the end of the protest, the government of Mexico City reported that 15,000 people participated in the march, and that 18,000 were present at the subsequent rally. Beyond this, a delegation from the IACHR that arrived on Monday 28 September will be visiting the mountains of Iguala, Guerrero, where relatives of the disappeared have found clandestine graves. Mario Vergara, member of the organization that was founded after the search for the disappeared students yielded dozens of illegally buried corpses, observed that the intention has been that the delegation see the work performed by the families. “We want them to see something real, to see the work that we are doing and under what conditions […].” His organization has found more than 75 bodies and has located several sites to be investigated.